’Tis the season of gingerbread houses topped with icing, gumdrops and candy canes — treats made slightly less appetizing when you consider the trouble they caused two children in the classic Brothers Grimm tale. But there’s no need to fear the sweet-looking structures of the National Marionette Theater’s Hansel and Gretel, a puppet performance with 42-year-old roots, at Burlington’s Black Box Theater this week. The Brattleboro-based company, founded in 1967 by David Syrotiak Sr., staged the peasant fable of Germanic origin in its first year. Since then, the theater has traveled the globe with expansive fairy-tale fare, and it received a citation from Union Internationale de la Marionette in 1975 and 2004 for excellence in puppetry — the first American marionette theater to earn that honor. In the 1980s, Syrotiak’s sons, David and Peter, joined the family biz. “We’ve always been involved in puppetry … We had all these puppets around the house,” recalls David Syrotiak Jr., who learned to manipulate them by dangling hand-carved marionettes over his bunk bed. The elder Syrotiak, now 73 and retired from road performances, helped get the production off the ground by managing the set design and painting in the transformed industrial building that functions as NMT’s Brattleboro studio. Because NMT prerecords the vocal tracks for better quality, he also voices the witch. Each of NMT’s productions requires a solid year to create. “To build a marionette from scratch takes about 100 hours,” says Syrotiak Jr. From the title characters right down to the passerby birds and ducks, Hansel and Gretel calls for 16 of them. A 50-foot-long scroll of painted scenery and music from Engelbert Humperdinck’s 1893 opera Hänsel und Gretel will provide the backdrop in this production. 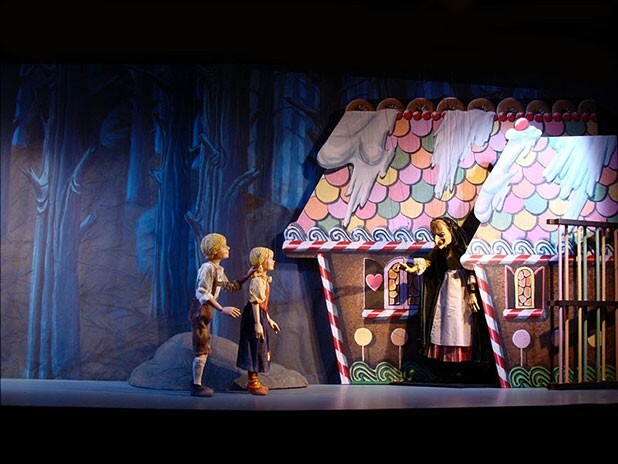 Hansel and Gretel, National Marionette Theater, Friday, December 18, 7 p.m.; Saturday, December 19, 2 and 5 p.m.; and Sunday, December 20, 2 p.m., at the Black Box Theater, Main Street Landing Performing Arts Center in Burlington. $10.